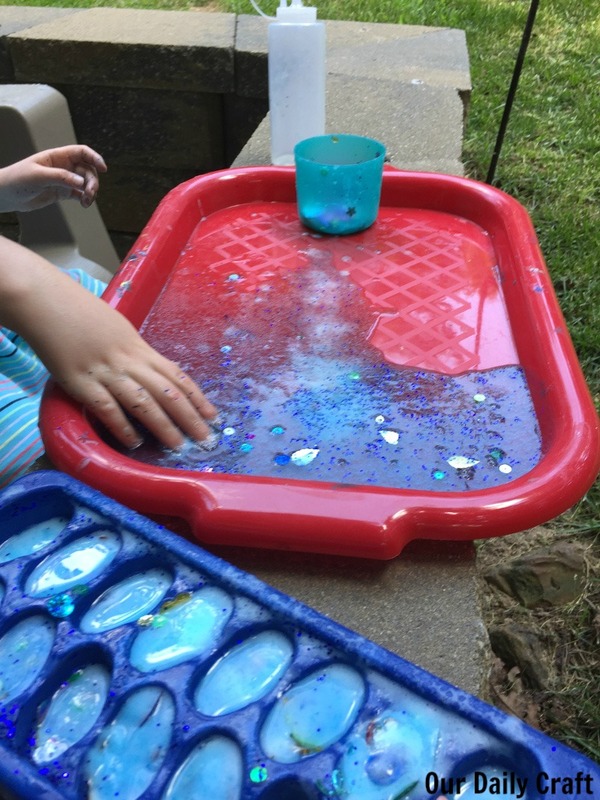 This easy frozen science activity will keep kids cool on hot days, and extension activities give them something to do while resting in the shade. 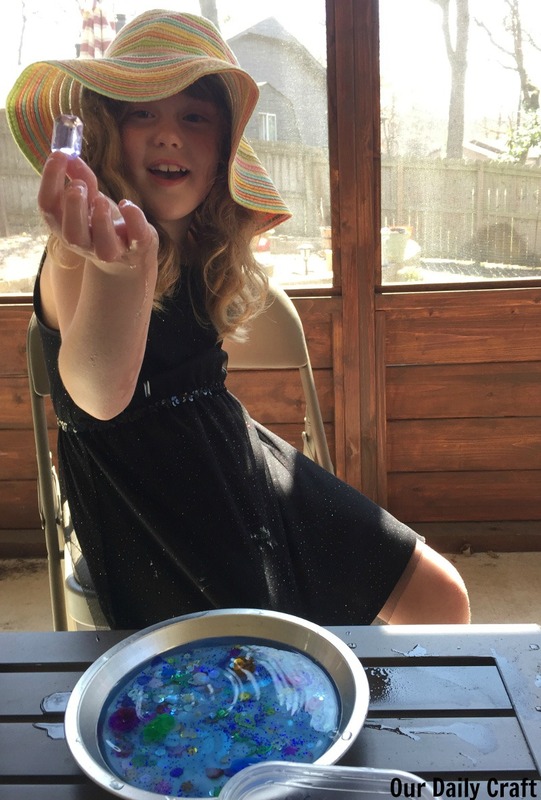 The girl wanted to be outside all day during spring break, but she was sweltering. She didn’t know what to do. I wasn’t too excited about being outside, either, with highs in the 80s and a bright, hot sun overhead. She went for the summer activity flower pot, which was still sitting on the bookshelf, and pulled a stick. Fizzy frozen science, it said. 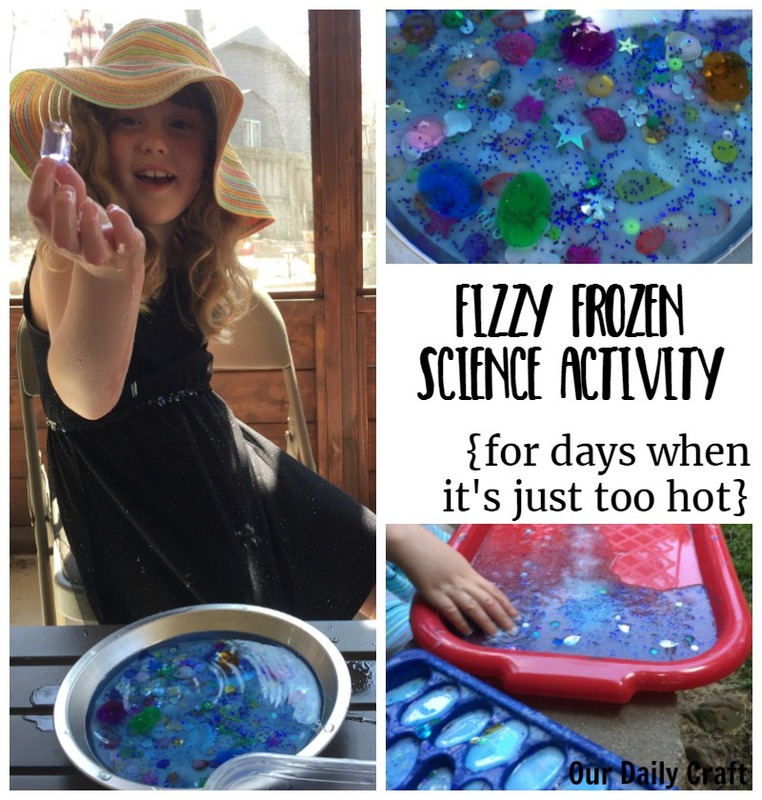 It’s a good thing I hadn’t cleaned out the freezer lately, because the stuff I made for this activity over the summer was still there (she used it once and I refroze the rest). I must have followed the directions on the post at Fun-A-Day, though I don’t feel like I used that much baking soda in mine. I think I used blue raspberry Jell-o and blue glitter. I added a bunch of plastic jewels as well as some confetti in fun random shapes. Make this in advance (not, like, nine months in advance, like I did) and you’ll be ready for any hot day. This is your typical baking soda-vinegar reaction, with the extra fun of being frozen (and having jewels hiding inside). Set your kid up with a tray and a squeeze bottle of vinegar and let them spray and dig for treasure. Play in the cold, goopy stuff left behind. Repeat. The girl wasn’t as into it the first time, but the second time she had a lot of fun making big fizzy stuff and digging out all the treasures she could. Have a bowl handy for collecting the treasures. 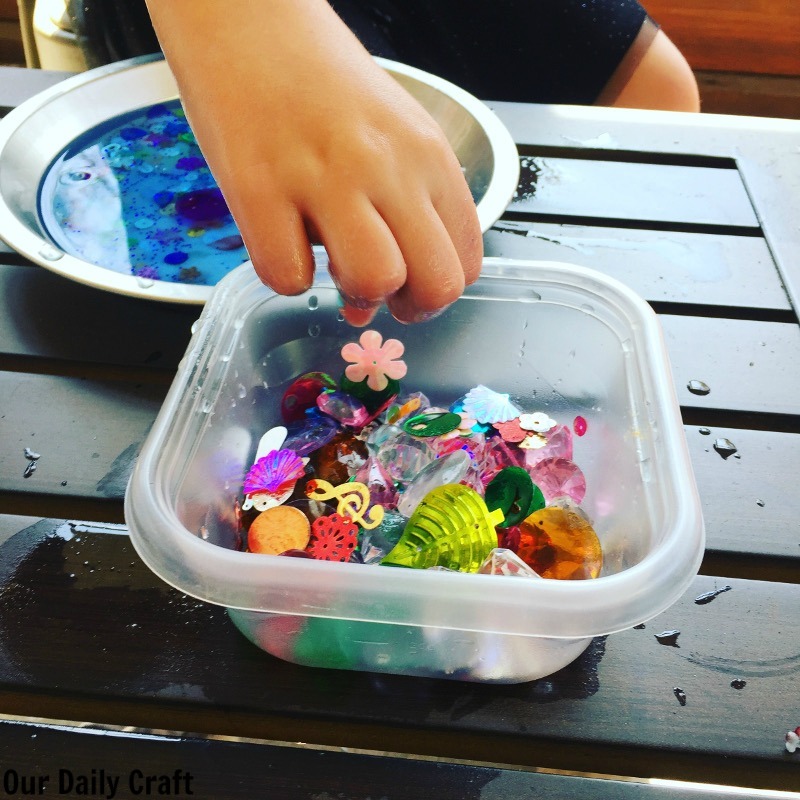 These activities are especially good if you can do them under a ceiling fan. How do you beat the heat and still manage to play outside? I’d love to hear your ideas. If spring break was any indication, we are in for it this summer!